There are lots of do’s and don’ts in planning a kitchen renovation. I’ve seen and brought to life a lot of good kitchen plans, and guided clients away from bad plans that just wouldn’t have worked in their space. I’ve also helped many clients find solutions to their specific needs through the design phase; here is my basic ‘start here’ list before even talking about aesthetics, which I’ll talk about in a forthcoming post. The first question I ask in an initial consultation is, “What are your needs?” This is often a question that gets neglected because we are all so used to making do with the space we have, so I suggest starting with a fresh look at the room available as blank slate. Out comes the paper and pencil, and an empty outline of the floor area is drawn. The next question is access; this usually predetermines a significant part of the design. Can doors/windows be relocated or altered to improve function if necessary, and does the budget allow for it? How about moving the major appliances? Sometimes even a small shift can make a big difference. How many people are usually in the kitchen at the same time? There are different needs for a family than a single person or a professional couple. Where are the doors into and out of the kitchen and how will they impact the space? Is there room for an island (suggested minimum 42” between counters) if desired or a peninsula countertop? Is there adequate space for stools at an eating bar? Is there a direct line to the coveted coffee prep area that doesn’t have to impede other morning traffic? The classic ‘work triangle’ between prep & cooking area, cleaning zone and food storage is a starting point. Generally speaking, there shouldn’t be a long walk to any of them. Ergonomics is everything because there’s nothing more frustrating than daily inconveniences in the kitchen. The food prep area should be close to both the refrigerator and the cooktop. It should also have convenient access to knives, cutting boards and food storage containers. Within reach of the cooktop should be cooking utensils, with pots and pans as close as possible. If there is a separate wall oven, make sure there is a heat-proof drop zone close by and keep those oven mitts handy! Are you a baker? 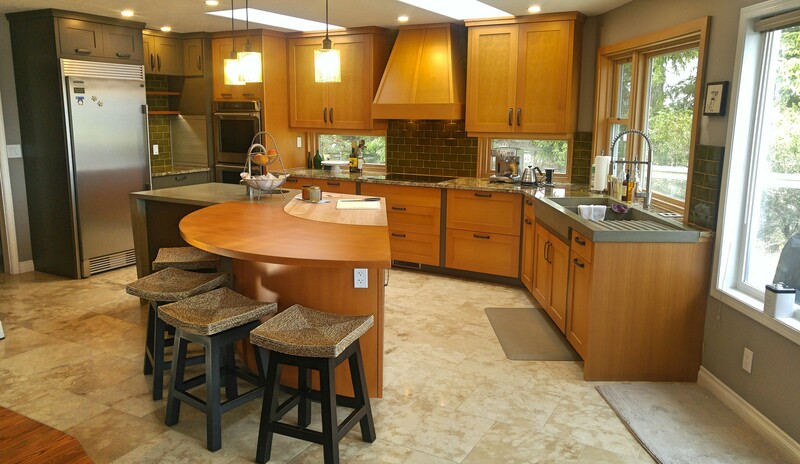 A spacious floor plan might allow room for a dropped counter for kneading breads or rolling pastries. Ideally the cleanup zone should not come between any of these. How many appliances do you have? Where will they be stored? They don’t all have to go on the counter. What about baking supplies, canned goods and food sundries? Most kitchens don’t have space for a walk-in pantry; tall pull-out pantries in limited spaces are a good option because the entire depth of the space is reachable, so nothing gets buried at the back of the shelf. Pull-outs above the refrigerator make great use of a hard-to-reach space as well. Lower cabinets are almost exclusively drawers and sliding components these days, because who wants to get down on their hands and knees to dig through the bottom shelf? And of course don’t forget waste, recycling and compost! Clean dish storage should be adjacent to the sink and dishwasher, preferably closest to the eating area for convenient dinner set up. It’s very important to know what the limit is before you begin. Sometimes this can predetermine much of the above conversation, and sometimes the ‘need-vs-want’ card has to be played to keep things realistic. On the other hand, more of the ‘wants’ may be possible than previously thought, making that dream kitchen within reach. Much of the budget scope can be adjusted through material choices, for example quartz vs laminate, natural stone floor tile vs a man-made material (so many excellent new products!) Dovetail drawers or doweled melamine? The choices are many. If your wish list produces a number that’s too high, don’t give up, ask for some more cost-sensitive options that would still fit your needs. Above all, be comfortable with the designer & kitchen contractor you choose. They should instill confidence and be easy to talk to, listen and have answers for all of your questions and be willing to work within your parameters.